Related post widget is one of the most useful widget. It shows similar posts at the bottom of every post. It is so popular now adays that not only bloggers but webmasters are also using it. It works automatically and doesn't need to update after publishing new posts. I recommend using this widget because it helps to increase you page views as it shows interesting posts at the bottom of every post with thumbnails(images). You can find related posts widget in other blogs and websites but most of them either don't work or its very difficult to add it to your blog. So I brought a related post widget which works on every blog and website and is also very easy to add it to blog, its Linkwithin related post widget. Normally when this widget is added to blog it not only appear in the post page but also on homepage below every post which look rubbish, so I found a solution for it after which it show related posts only at the bottom of posts. It is 100% free no sign-up needed. Easy to add to blog or website. Friendly view for blogs having dark background and light text. (1). 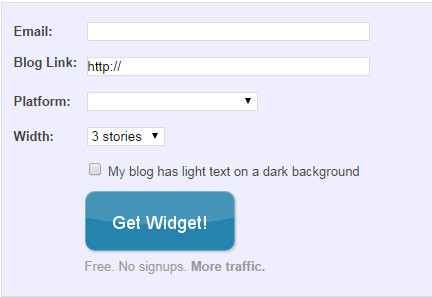 Go to linkwithin and fill up the widget form by writing E-mail address, blog link, select platform as blogger, select number of posts in the last step of widget form and check the box if you have a dark background and light text in your blog. (2). Click Get widget it will redirect you to the widget adding page. (6). Now click Add widget and you are done! Thanks for visiting http://101Helper.blogspot.com, if you have and problem related to this post ask me in comments, follow and subscribe for latest news. 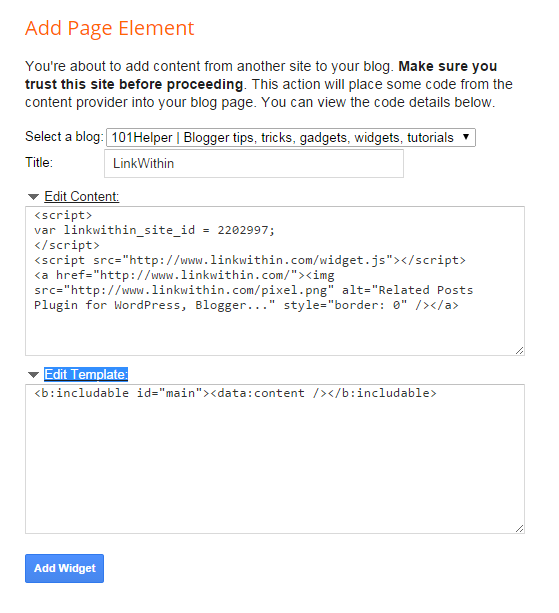 Tags: related post widget, linkwithin relates post widget, add related post widget to blog, 101Helper, gadgets and widgets for blogger.